As attention spans dwindle, the need for engaging, high-quality video content is becoming a premium; especially when it comes to church content. We’ll help you stand out in social media feeds, such as Instagram, Facebook, and YouTube, with promotional videos that highlight your events, promotions, and services. When you choose the Video Fire Monthly Plan you’ll be provided with a team of on-demand professionals who can create videos that match your messaging and target audience with precision. Video requests are normally delivered in 5-7 days dependent on complexity to ensure your messages hits every focus point. Scroll through the videos below to see real promotions we’ve done for our partner churches. Log into your account and send us a request regarding your video and we’ll create original, engaging, and high-quality content within 5-7 days. DO YOU PROVIDE THE VIDEO SIZES FOR FACEBOOK AND INSTAGRAM? Yes, we do delivery the social media video files in the size of your choice to best be used on Facebook or Instagram. We can make it squared or vertical for Instagram Stories. If you don’t know the correct size, then tell us the social platform you are using and we will create the design to best display in that setting. 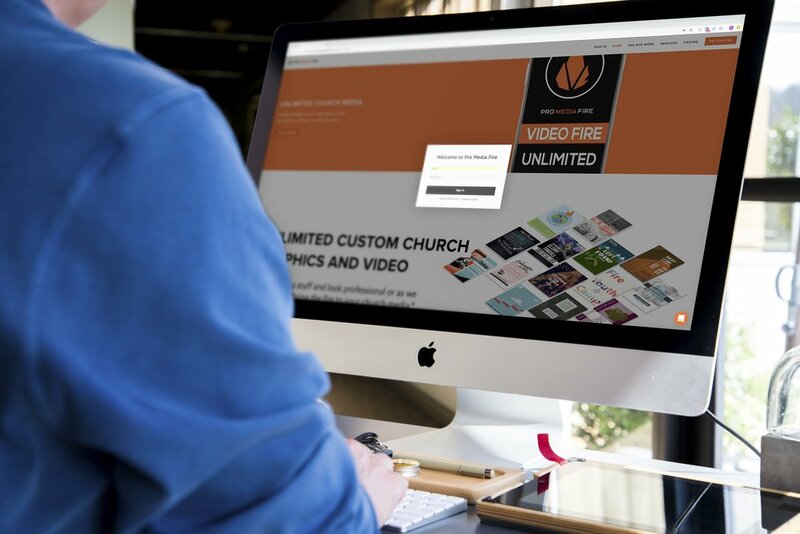 WHAT DOES UNLIMITED CHURCH video creation DESIGN MEAN? You have dedicated Pro Media Fire team members as per your monthly plan that you can send as many requests as you want. Now your professional media team is working on only one active project at time, but you'll never be limited with how much you can send in. At the completion of one project, they will start another. You are also unlimited in your revisions. True fire on a video takes time, but we pride ourselves in doing it as quick as possible. For our Video Fire Plan, usually it is a 5 business day turn around for sermon hot spots videos for social media. Professional event commercials can take up to 14 days depending on the depth of the project, such as animated graphics in conjunction with the project assets. There is always a balance between speed and a quality result. Our team is always working to get your a professional video with a quick turn around. For video commercials you must provide the video clips, images photos or request stock inventory used in the video. We will create animated promo videos but all copy and art direction must be provided. Sermon bumpers we require art direction and footage or access to the church stock video footage account. For sermon hot clips you need to provide the video from your service either from YouTube, Vimeo or send it to us with timeline and transcript of clip. You are responsible to provide the art direction (desired result) which we help you understand in our request forms, the copy (written text), and any assets (photos, videos, or access to stock video) used in the video. Tell us what you want and we will provide the fire when we make it. What file formats are the videos delivered? All videos are delivered as mp4 files. We will deliver the video requested in the size needed for social media platforms or 1080HD (1920x1080). We can guarantee the size requested unless the photos and video provided for the project are high resolution files. We do not create videos in 4k. Additional charges apply for cinematic exports used in movie theatre ads or other file formats. Pro Media Fire can handle almost all of your church graphic design, video and social media post needs. We do not do videos beyond 300 seconds, websites, UI/UX design, coding, branding or logos, or complex illustrations. DO YOU PROVIDE RUSH video project ORDERS? Rush orders are provided on a limited basis, if our team has the time available. You can reach out to us during business hours and a rush order quote will be provided depending on the scope of the video project.